Having a sweet tooth is a known obstacle during weight loss programs. Lacking any nutritional value, sugar is a high-calorie substance that contributes to weight gain. However, there are some who go so far as to say that sugar is actually a toxic substance capable of having harsh consequences on our health. Before you reach your hand back into that candy jar, have a look at what sugar is actually doing to your body and determine if it is something worth keeping in your diet. Lactose is another type of sugar, and it is found in dairy products. 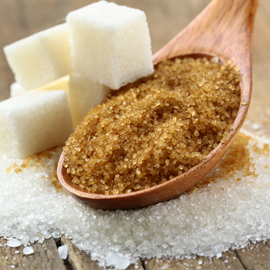 The white table sugar that comes to mind for many people is sucrose. This is a refined sugar that is commonly added to foods to make them sweeter. Fructose is the sugar naturally found in fruits, vegetables and whole grains. While fructose and sucrose have similar effects on our health and weight level, fructose is generally packed in nutrient dense sources, while sucrose is commonly found in foods that often lack much nutritional benefit. You can identify sucrose in a food item by seeing the word “sugar” on the ingredient list. While not strictly sugar, high fructose corn syrup is identical to sugar in nutritional value. Despite its presence in many items, corn syrup is not a healthy alternative to sugar. According to the Cleveland Clinic, the average American consumes 22.2 teaspoons of sugar per day, which equals just over 330 calories. Since sugar is devoid of nutritional value, this is a large chunk of a person’s daily calorie allotment going to food that is not providing you with any health benefits. Sugar is added to a lot of foods, so you may not realize how much sugar you are eating. Begin evaluating how much sugar is in the products you eat, and try keeping count of how many grams of sugar you consume in a day. Making a few substitutions in your diet and switching to natural, nutrient-dense sources of sugar like fruits, vegetables, low-fat dairy and whole grains may help you lose weight.